Since 2006, 10 UC Merced undergraduates have been awarded the prestigious Donald A. Strauss Foundation scholarship. This year, two more joined their ranks. The Strauss Foundation selected biological sciences major Pranuthi Kanneganti and public health major Akhila Yechuri as recipients of this year’s awards. The Strauss Foundation awards 15 scholarships annually to sophomores and juniors from select California universities who propose public service projects focused on social change. Winners receive $10,000 and mentoring from the Strauss Foundation. Prospective applicants learned of the scholarship from UC Merced's Calvin E. Bright Success Center, which provides students with mentoring, learning resources and access to a variety of competitive scholarships, including the Strauss. Bright Center Associate Director James Barnes identified qualified students and invited them to Strauss Scholarship information sessions. According to Barnes, this year’s applicant pool was exceptionally strong. Applicants met with Barnes regularly. Together they developed a timeline to ensure that students met important application milestones. This included coordinating with members of the community to identify a project, obtaining recommendations from community partners, and attending application coaching sessions. Winners were informed of the Strauss Foundation’s decision in April. Projects are scheduled to run from September 2017 through April 2018. Kanneganti’s project, “Stepping Into Science,” encourages female and minority students to pursue STEM careers. Kanneganti will work with approximately 80 sixth-graders at Merced’s Peterson Elementary school and use hands-on activities to help students develop the skills they need to succeed in STEM. “This project allows me to work with children and get a better understanding of the best ways to interact with them while encouraging them that anything is possible, regardless of what other people tell them,” Kanneganti explained. But she won’t be working alone. Kanneganti recruited a team of UC Merced undergraduates — biology majors Stephanie Quezada and Leticia Diaz, chemistry major Christian Ramirez, computer science and math major Belinda Vasquez, and psychology major Victoria Sierra — to help her make “Stepping into Science” a reality. “The project may end in April 2018, but I hope that it leaves a positive, lasting impression on the young students,” Kanneganti said. For Yechuri, the Strauss Scholarship allows her to continue a project she began in January. As the recipient of a Community Engagement Student Fellowship from the California Campus Compact, Yechuri worked with three teachers at Merced’s Yosemite High School to conduct civics lessons. 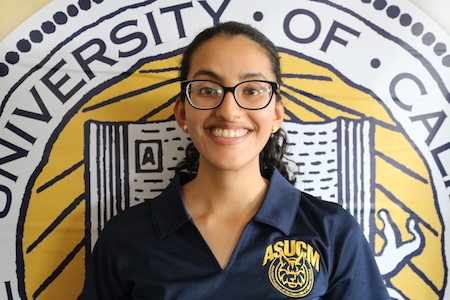 With the Strauss Scholarship, Yechuri can expand her earlier outreach efforts into a multi-part civic education program in Merced high schools. Her project, “Civics in the Central Valley,” provides civics education to underrepresented and underserved high school students. It also offers high school students the opportunity to meet with local officials and engage in student-led development projects. According to Barnes, a campus with one Strauss Scholar is rare. But having two winners in one year is a remarkable feat for any university. Barnes encourages sophomores and juniors with big ideas to serve others and a 3.7 or higher GPA to contact him at jbarnes@ucmerced.edu for more information about this opportunity.